August 2004. Photo sent in by Helen McKinlay, Ontario, Canada. "..........my husband Bill McKinlay went to John St School cc 1948, he was born March 1936. Glesga Pals may be interested to know that Dave Holt, in the front row went on to play for Hearts." 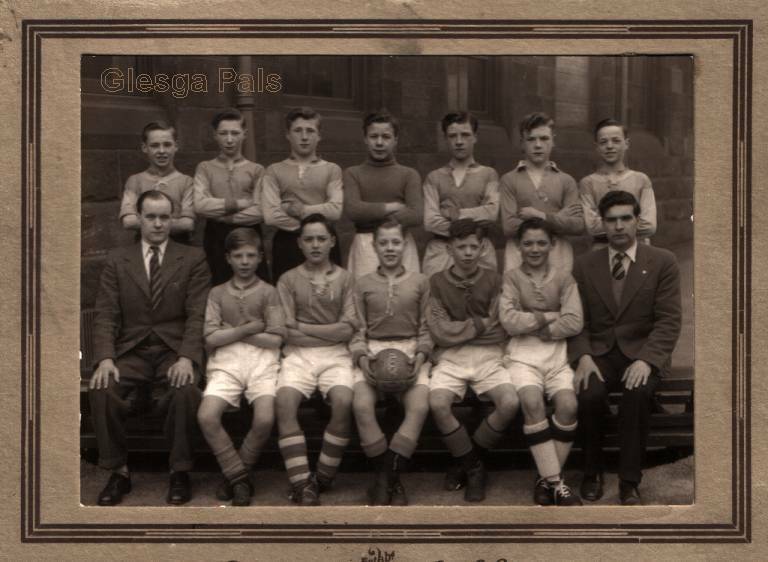 Re 1948 John Street Fitba' photie.Back row (6) is Gavin Innes,he was an officer in the 61st Calton B.B. of which I was a member. Regarding the school photo of John St Sec cc1948. The school teacher Davy Letham became the PT instructor at Bernard St School during the early sixties. He was chairman of Queen's Park FC. I remember playing against him ( pupils versus teachers ). He was a solid man. He played for Queen's Park and the British Olympic team. Just read that Davie Letham the legendary Queen's Park man has passed away at the age of 83. ....he was a gentleman on and off the field, and a good friend for more than 50 years. I knew he hadn't been well these last months, but it is sad to lose a friend. I'm sorry to hear about this too..must tell my old school friend - who now lives in England.. He was always so even-tempered...unlike the other female teacher..didn't know he was that age though.. Remember Davie as a hard task master in the gym at John St. he would also kick lumps out of you to toughen you up for the school fitba`,his favourite methods of corporal punishment were to grip a sideburn between finger and thumb and yank oot a couple of hairs,ouch! !...ah can still feel the pain,but it wisnae as sore as hi!s "Torry rope" when he`d whack any miscreant across the bahookey with the knotted end of the rope used to raise and lower the bars at the side of the gym...still the entry into the schoolboy enclosure for the Real Madrid-Eintracht Franfurt game made it all worthwhile! shug..;you have written my story of the torry....for me it was for not having gym kit. allybally..;i was at a John Street School re-union some time ago, cheese/wine night. there were a lot of ladies of a certain age there, and when mr letham came in to the hall, there was a sigh from them. i wonder what the modern kids would have made of his disciplinary ways. i dont know if he had family i pass on my condolences. He was also past president of the scottish football league, and my schoolboy enclosure tickets were for gers v st mirren cup final.